This is a transcribed and edited interview with Zak Rogoff from the Free Software Foundation (FSF). It was recorded for the NetPosi podcast at the FSF office in Boston, Massachusetts. Listen to full audio. Zak: So I’ve always been interested in technology and design and building stuff, but I’ve also always thought that it was important to spend time doing social justice work, broadly defined. I’ve flirted with both and spent a lot of time trying to decide which one I was going to dedicate my career to then eventually figured out I don’t need to pick one. I can do both. 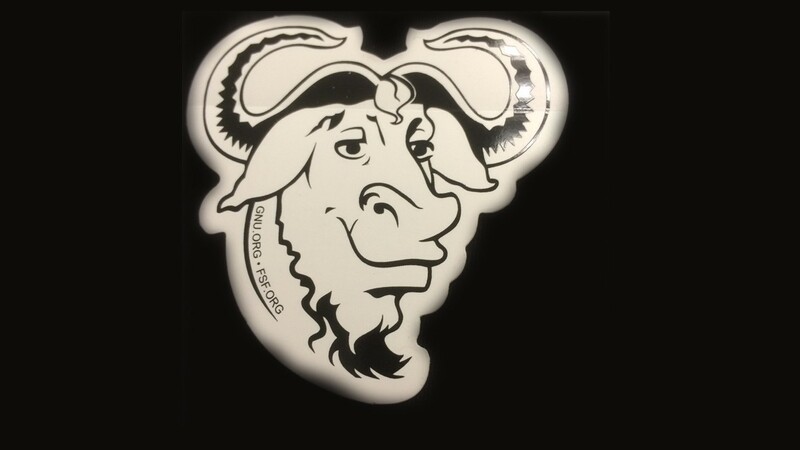 Drew: We are in Boston, Massachusetts at the office of the Free Software Foundation, which has a handful of little stuffed GNUs around the office. The Free Software Foundation just celebrated its 30th anniversary and I’m here with Zak Rogoff, who works on campaigns at the Free Software Foundation. Give me a quick introduction to the Free Software Foundation. Zak: So, as you said, we just celebrated our 30th anniversary. The FSF was founded in 1985 by a group of radical programmers led by Richard Stallman. The founding idea is that software should be in control of the users rather than the company that made it — or whoever made it. We have been, for the last thirty years, finding ways to make that dream a reality. The important distinction is that most software is proprietary software which means that the only thing the user receives is compiled object code, which you can run but you can’t change and you can’t study. So it’s a black box and, not all in cases, but in many cases people who use the software take advantage of that and do things the users probably wouldn’t actively consent to. The most prominent example right now is surveillance. That’s only one thing. So that’s not to say that all proprietary software is necessarily evil in my opinion, but it definitely shifts power in a way that isn’t necessary and isn’t desirable. So with free software, the code is available as well as the executable program. If the user wants to, they can study the code so they know what the executable program is doing. They can modify the code, they can share it and, crucially, this gives a level of power to the users that proprietary software can’t hope to achieve. So we have spent thirty years trying to find the best ways to promote free software and we’ve faced a lot of interesting struggles and challenges along the way. Drew: What are some of those best ways? What are those challenges & struggles? Zak: The thing that started off the Free Software Foundation was basically the software licenses. When somebody writes software and then they release it — or whenever you create a digital product and then you release it — you have to face the reality that digital things can be copied gratis and instantaneously. You don’t have the same kind of control over it like if you make a sandwich and you sell it to somebody. There’s different rules of the road. People have software licenses that use existing copyright law, proprietary licenses, that just basically says you can’t do anything with this I don’t want you to do with it. Ask me first and that’s what you find on Microsoft in addition to a bunch of other restrictions you can’t do with it. In the eighties, Richard Stallman, the founder of the Free Software Foundation, and some other people came up with this idea of copyleft, which is a legal hack on the copyright system. It basically ensures that the software you create is free software, meaning again you have the right to modify and redistribute it, and that you can explore it and study it. It’s not a black box, it’s actually an open system that you can understand. So the problem is that if the developer wants to convey those rights to a user, it’s actually non-trivial to state that legally in such a way that someone else can’t take it and change it. The purpose of these licenses the FSF publishes is to think through all the legal stuff and we publish this license that’s tested and legally robust. Developers that want their software to be free can attach it to their code. Because otherwise if a developer just types at the top of a software program this is free software, there isn’t anything or much of anything to stop someone with more legal resources to come and appropriate it and restrict the use of it. The point is that people want to make their software free but once you release stuff into the world, a lot of the time other people will incorporate it into proprietary things and restrict the use of those proprietary things, taking advantage of the work that the software developers did. A lot of software developers don’t want that, and aren’t ok with it. What we provide is this license where we basically we did the legal homework for you. Stick this on top of your software, and there is a body of precedent that shows it will be interpreted by the courts as respecting your rights as a free software user. So the main license we publish is the General Public License, the GPL. That’s one of the biggest things that we do. We also help when somebody doesn’t obey the terms of the license. We help them figure out how to do it. A common example is in free software, if you send someone a program that’s executable, compiled program, you’d also send them source code — and this a frequent mistake that people make,— they don’t send the source code properly. So if we find someone is doing this, we have an expert on staff whose job is to work with them and tell them how they’re legally required to if it has the GPL license attached to it. We help them figure out how to do it so it makes sense for them to distribute it. That’s one thing. Another thing is that free software challenges the dominant paradigm, in the software world and the world of technology in general. That world is very corporate dominated instead of being dominated by grassroots organizations, where you govern them. This is part of the reason it’s been hard to mix social justice and technology communities, but the free software challenges the paradigm because it’s radically decentralized and focuses on personal liberty and autonomy, instead of consumerism which is the guiding principle of most people’s involvement with technology. That creates friction, and has for the last thirty years, between our movement and the mainstream technology world. There have been some propaganda attacks against free software by the mainstream software world. We provide an alternative voice in that fight to support free software and help free software users and developers show there’s someone to stick up for them. So an example is that in the nineties, free software was gaining traction on the Internet, because the Internet was growing rapidly and since the beginning free software has been a core to the Internet. Zak: The most popular web server applications are free software, and have been for a long time. It is not necessarily something that an end user just goes to Google.com and notices they’re using free software, but the server, which is the program that creates the website and shares it with your computer is running free software, a majority of the time. The actual statistics shift, but the most popular web server programs are free software. Lots of other infrastructural things about the web rely on free software or free standards and protocols. There was a lot of momentum in the nineties and 2000's, there still is, but specific historical case towards free software and was coming in and challenging what at the time was mostly a monopoly. Microsoft was the behemoth that dominated the industry. A lot of proprietary software companies started threatening us for various reasons, like we were cutting into their sales, or they just didn’t ideologically like that free software proposed this decentralized, non-consumerist way of dealing with software. So there is actually a word for this: FUD. It means Fear, Uncertainty and Doubt. There were negative software campaigns about free software funded by Microsoft in the early two thousands, if I have my dates right. They were trying to get people to be scared of it and think it’s not legit. They’d say things like ‘it doesn’t work because there’s no company behind it, how can you trust it?’ that kind of stuff. Which is ironic because recently Microsoft announced that they have their own internal Linux distribution they use for their client services. Drew: So what’s the real world impact for people? What’s the impact of free software on the lives of people in the U.S., people who live around the world? What about people who aren’t developers, or who aren’t technologists? Zak: That’s a really important question, and it’s hard to answer. There is impact, but most in cases it is diffused and indirect. So there’s a bunch of ways I can try to enumerate impacts. The point where you see the biggest difference is if you are a software developer. Obviously, most people are not software developers, and that’s been forgotten too many times. This is, again, my perspective rather than what the Free Software Foundation might say, but one of the biggest impacts is an economic impact. If you think about it from a Marxist perspective, you can think about software as building blocks, you can think about it as a means of production. People are able to build competitive software applications from scratch, any software application, whether it’s developed inside a company and proprietary or developed as free software where you use the existing building blocks in software libraries. The fact that those free applications are available, those free libraries are available and that there’s free software available for people to use on their computers to make things, that has an economic impact. The burgeoning software industry in India wouldn’t look the same without free software. There are tons of people around the world — this is not average people but people with exceptional computer interest and aptitude — who have taught themselves programming and system administration by downloading free software and using it since they were kids and taking their computer apart digitally and physically. Those people have careers now. Another thing is something I think is coming rather than its already here, which is a crucial step for the role of computers in our lives in the 21st century, which is basically using free software as a means to guarantee a higher level of transparency in the socio-technical systems that are crucial to society and our lives. There’s this example of life-or-death software which is software that helps run a plane or software that does air traffic control or runs embedded medical devices, inside your body. Free software is inherently audit-able, which means an independent expert can review what’s going on with it and how it works instead of it being a black box. There’s a growing movement and I think we need to push really hard on this, especially for the life-or-death things but also for government and infrastructure we depend on to. It needs to be free software so that people can see what it’s doing so we don’t have to count on those that already have power over these systems to make the source code work properly. Use free software as a tool for transparency and accountability. It’s interesting because those two things are two of the everyday real impacts of free software and they work based on different properties of free software. The first one I talked about is more about its legal to copy it for free and also the fact it is transparent, it liberates the means of production. The second one is just the fact that it’s transparent. They’re related because the fact that it’s transparent and it being copyable is very hard to separate. But those are two things I think also are part of a holistic movement for community and liberty over centralization and corporate control. This is something I really care about explaining to people. I meet a lot of people who are like, ‘I’m an anarchist!’ and they’re using a mac. You can be an anarchist and use a mac, or you can believe in local farming and use a mac, but those same tenets of wanting things to be decentralized and in control of people, the people using them, and serving the people that use them also should extend to the computers that we use. It’s ever more important as another part of our lives moves onto a computer, that we assert our rights to autonomy in the digital space as well as the physical space. Drew: In activist groups they often focus on a long-term vision and a short-term vision. I think you explained in a lot of ways the long-term vision. What do you think about the short-term vision for the free software movement? What does success look like? Zak: Obviously there’s different paths you can take, or different venues we’re pursuing, but two of the biggest ones are federated decentralized web systems. Drew: Federated decentralized web systems? What does that mean? Zak: The Internet was initially radically decentralized. The original twentieth century model of media creation was a broadcast media model where it is centralized. There’s like a company like New York Times that creates content from a central point and if you want to be heard you have to go talk to the New York Times. It’s a toy example, but they’re the gatekeepers. One of the things that was really cool about the Web originally was that because of the technological architecture of it, it was radically decentralized. Anybody could create a web server with their own computer, with a surprisingly small amount of training. It sounds intimidating, but it’s not actually hard. Anybody in the world could visit your computer just about as easily as they could visit Microsoft’s website. As capitalism and the Internet collided in the nineties and 2000's, companies found ways to create new services that were really exciting, and people liked, like social media, YouTube, you name it, but they took that opportunity to centralize the Internet. Centralization is easier to monetize. This leaves us in a bad situation because not only are we dependent on certain companies for communications platforms that run our lives like Twitter, YouTube, Facebook, but also we’re giving those people our personal data. Their business models rely on collecting information about us and when I say personal data, I don’t necessarily mean your social security number, but your browsing history can be your personal data in a lot of instances. It makes us vulnerable from a cultural perspective because a small number of powerful actors that don’t necessarily have our best interests at heart control our information and our media. Zak: I want to do more research before making a specific claim about this, but for a long time Facebook said anything you put on Facebook belongs to Facebook, which is ridiculous if you think about it. A Facebook page has your name on it, a picture of you, you can think of it as expressing yourself. They’re also harvesting everything you say, or they can. Drew: And those terms change, too. Zak: Yeah, they change all the time and people don’t look at them. I don’t think it’s realistic to expect people to look at them because they’re opaque and confusing and seem irrelevant. The second thing is what people have been highlighting in the last few years has been the data centralization. Computer security is a huge topic, and I won’t try to get into it in a lot of detail. But there’s this concept in computer security of this honeypot, which is basically if someone is looking to steal someone’s information, and that information is all centralized on one computer and it makes it way easier to steal it because they would have to break into one computer and get all of it. It creates that situation. That’s exactly why the NSA set up their famous PRISM program, which basically is they just work with companies through coercion and other means to get the companies to give them access to people’s personal information and they use that to surveil people. So basically the movement to re-decentralize the web is trying to create software solutions that serve the same needs as YouTube, Facebook, Twitter, whatever, without this kind of centralization and maintaining freedom and autonomy in a way that’s commensurate with the ideas of the free software movement. I don’t think it’s worth getting into it in a lot of technical detail here But say you use YouTube, you have your server controlled by Google and Google controls what goes in and out, and it’s hard to exist in YouTube and exert control in meaningful control you can verify and define as real over what’s done with the information that you submit to it and collects about you. By contrast there is one project called The GNU Media Goblin, which does a similar thing to YouTube, it’s a software program that runs on a server that creates a website that you can go to that people can post to, videos, pictures, whatever. In addition to it being free software itself, GNU Media Goblin is set up for in system called Federation, which means it supports, you can create a constellation of independently controlled GNU Media Goblin servers, each with their own library of media, and somebody can easily visit one page that collects the media from all of the servers, so they don’t have to deal with going to all these different websites, it’s still a streamlined user experience like YouTube is, but the media isn’t saved all in one place, and the user account information isn’t saved all in one place. It’s saved in different Media Goblins spread out in the web. Say one of the Media Goblin server owners says I’m going to start abusing the users of my server, I’m going to install malware on their computer when they visit my site, I’m going to start putting up obnoxious misleading advertisements that are like a big button that says “download” but instead of a download, it’s a virus. If that happens it’s way easier for the users to move their personal account to another Media Goblin and cut the media off if they want to, than it is in the case of something like YouTube where people start using it and it becomes a community, and they become locked in and YouTube can mess with you and do stuff you don’t like. Decentralization using something like federation addresses the need for spreading out user information, but it also addresses the need to spread out control over cultural works. That’s one of the big thing. What does a success would look like in five years? More people know about these alternative, decentralized media services and less people feel like YouTube and Facebook and Twitter are the only option for those things. Another thing is availability of free software to control the low level parts of our computers, especially mobile computers. Companies have also taken the rise of mobile computing as an opportunity to get people to buy computers that are more locked down than ever before. As a good example, a normal cellphone you have in the United States or Europe or most places, its basically two computers in a tiny box. There’s one you interact with Android or iOS, or something else, that one can be run with free software. But there’s another one that’s basically a radio that communicates via the cell system that’s by a complicated system of law and technological restrictions, it’s basically a black box that’s ok and proprietary. It basically has the right to interrupt power over the computer you do interact with. Even if you try and make sure the stuff on your phone isn’t spying on you, the other computer in there can reach in there, change the software on its own, and do whatever it wants. There’s lots of documented things where government security agencies have the ability to turn on the microphone in the cell phone and record what you’re doing. That’s a stark example, but it’s only one of them, similar issues exist for laptops, and other computer hardware. That’s a complicated thing to address. It would be really awesome if five years from now it was easier to buy hardware devices that you could use without relying on black box proprietary software. The Free Software Foundation has a program called Respect Your Freedom which is a certification program where companies that want to make hardware devices that respect your freedom by working with all free software and not requiring any proprietary software, they can create them and send them to us. We take them apart, and make sure it’s true, and put a certification mark on it. If you care about this, you can go to FSF.org/ryf and see these devices and buy one if they interest you. There’s now a wide variety including laptops, 3D printers, some computer peripherals. Drew: What do you think is a mechanism for making those kinds of changes? Do you see that being technology? Is that policy? Zak: I don’t know what would be successful. I like diversity of tactics, but I feel strongly that government should step in to legally require the people that make our devices to make them transparent to us and make them modifiable so we can have control and verify they aren’t spying on us. It’s important to have that kind of control, where we don’t have to have everyone be a programmer that understands every part of a phone. Even the most advanced, specialized experts don’t understand everything that goes into the smallest computer. They just understand part of it. The important part is if it’s transparent and we can modify it, somebody can look at it and make it known if it’s doing something we don’t want it to do. Which is not possible in proprietary software as easily. I think that regulation and legislation are crucially important. There’s also work to be done in the judicial system. Organizations like the Electronic Frontier Foundation do a lot of legal work which is really important. Another thing is a cultural thing, which is getting people to care about technology and its role in their lives. It’s not going to look exactly like the food movement but it’s a good parallel because it’s something where everyone uses food everyday, why don’t we start thinking about this critically and where it comes from. Everybody uses technology every day but most people don’t think about it critically at all. We need that, and we’re seeing a kind of rise in that consciousness in people in high profile stuff like the SOPA/PIPA fight or the Net Neutrality fight. It’s tricky, so I think legal action is important. Legislative, regulatory, petitioning. Regulatory agencies make decisions in the United States and ask for community feedback from the world and organizations. We also need a cultural movement to reject centralized proprietary systems that steal our autonomy. And we need to go for things we can control and thrive on. Drew: Alright cool, now let’s talk about magic. If you had a magic wand and you could wave this magic wand and do one thing to make the world more free, more open, more just, more fair. What’s would youdo? What’s one thing you would change right away? Zak: That’s a cool question… I would make it so that basically government procurement all over the world for all governments really heavily favored free software. Right now most software used by most people is proprietary but the U.S. government especially likes Microsoft. This is just a ridiculous factoid that but I believe Lockheed Martin, the people that make missiles and stuff, they provide the contact management software that’s used in Congress. So if someone in Congress has a problem with their contact management software they call Lockheed Martin’s support line. This is a good place to start thinking about the fact that free software is important for accountability and citizens to benefit from the software. I would make it so the U.S. government and other governments commissioned software they couldn’t commission proprietary software, they had to use stuff the citizens can inspect and understand, but also copy and use for their own purposes. Drew: Do you using free software would have prevented NSA spying? Say we had that wish and governments were using free software — and not just city governments that provide roads and things we interact mostly when we interact with government, but federal government as well. Say the NSA and those agencies were using free software. Do you think that would have prevented the mass surveillance that has happened? Do you think it would have been different? What are your thoughts? Zak: I think the short answer is no, because the level of control the NSA has over the global communications infrastructure goes even beyond software into hardware and human coercion. It would help and the same values and freedoms that are embodied by free software are probably the antidote to surveillance. Decentralization, accountability, the ability to verify what your hardware and software are doing are essential, but free software alone isn’t enough. Decentralization is really important because of the honeypot issue from before. Even if Facebook was using different software, they still have everybody’s information in their database. If the NSA compels them, they’re going to hand it over. I think most people would be surprised to learn the power that government agencies have when it comes to getting people’s personal information. It flagrantly flies in the face of the 4th amendment right to privacy. I think it’s not enough, we need radical decentralization of control and data on all levels — hardware, software and social networks. The NSA has literally things built into the hardware that copies up all the information. Another interesting thing about this is that the NSA actually uses a lot of free software, because the kinds of super large scale data processing they do to try and churn through everybody’s information and find things that are interesting to them. Alot of the best tools for that were developed by the scientific world and information processing stuff and our free software, so it’s more than just free software, it’s just a tool. Drew: Interesting. We have a couple more minutes. Any shout outs you have? Any events coming up? Any resources you want to point anyone to that’s interested in what we’ve talked about? Zak: FSF.org is a great place to get a nerdy, technical introduction to the idea of free software and why it’s important. We have a conference we run every year Libre Planet, in March in Boston. It’s very welcoming to people who don’t already have a free software background and there’s a lot of space there to approach why free software is important for all different angles, whether you’re interested in the technical perspective or an activist for privacy or liberties, or whether you’re interested in a DIY attitude towards your computer, or you just want to meet people who care about this kind of stuff. It’s really great. The Electronic Frontier Foundation does an awesome job talking about civil liberties issues, but if you’re looking or listening to this podcast you probably already know the EFF and I think those are the two things I’d point to for starters. This is interview is originally from @NetPosi, a podcast about activism and technology. You can listen to the full interview and you if you want to hear more interviews like this you can subscribe using iTunes, Soundcloud,or by email on netposi.com.